Jules Verne is perhaps best remembered today for the novel Twenty Thousand Leagues Under the Sea . The story of Nemo and his advanced submarine has been adapted to screen many times, as have his works Journey to the Center of the Earth and Around the World in Eighty Days . So popular were movies of Verne’s adventure stories that it was tempting to produce anything that his name could be attached to. 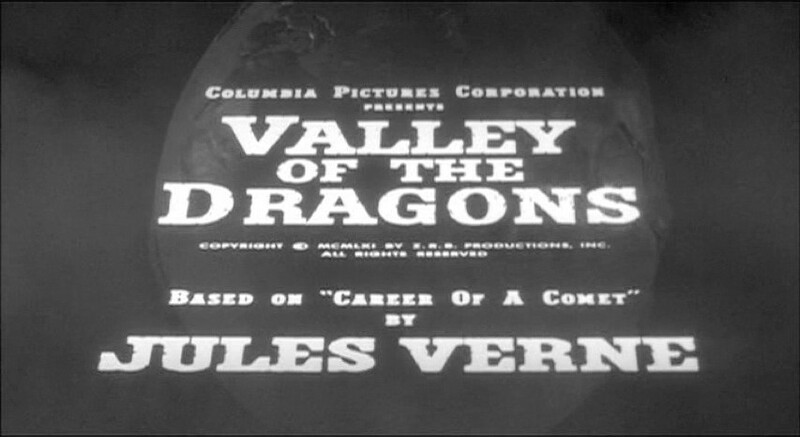 For instance, by using just the barest premise of Of On a Comet (here credited as the subtitle of the translation called Hector Servadac; or The Career of a Comet ) the producers of Valley of the Dragons were able to promote a rambling Lost World ripoff as being a Jules Verne movie. 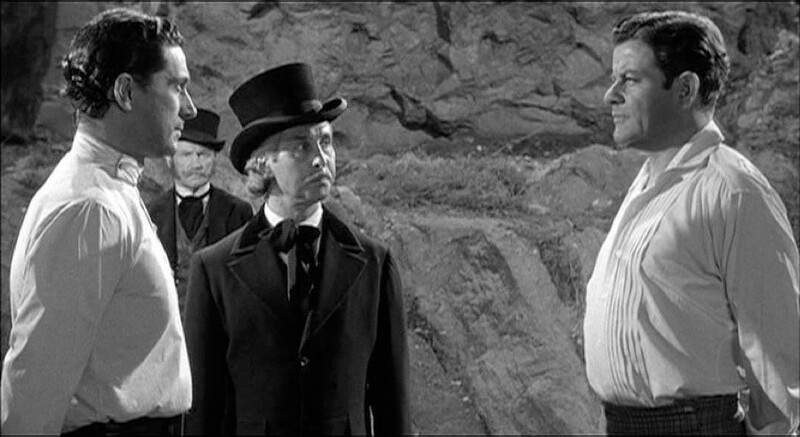 Servadac and Denning prepare to duel over a women about whom they’ll both soon forget. The book, originally titled Hector Servadac , focuses on the eponymous character, who is a Captain of the French Algerian army. He and more than 30 other people are whisked away on a comet when it skims the Earth. Servadac leads the faction of survivors who use science and cool heads to return home a few years later. All that this movie keeps are Servadac (Cesare Danova) and the comet — and Servadac is reduced to a co-star alongside the inserted character, Michael Denning (Sean McClory). One of the Neanderthal that attack our heroes. After a duel between Servadac and Denning is interrupted by the comet, the adversaries find themselves in a world populated by cave people and threatened by the usual variety of dinosaurs. The natives are split into two warring tribes, and our heroes conveniently become adopted by members of the opposing factions. They find girlfriends and gain respect within their communities, which proves useful for combining forces against the dinosaurs, which have been driven out of the forest by a volcanic eruption. The ladies love cool Servadac. This is an odd Lost World movie in a few ways. These places are generally preserved through some disaster or quirk of geography, but this is the first time that I’ve seen “carried off on a comet” as the cause. Servadac determines that the comet last scraped Earth 100,000 years ago, which creates the next oddity about the film; there’s no returning to the modern world. Sadly, it’s not unusual for tribal humans and dinosaurs to co-exist in these things. There are generally even tribes that are split between the savages and the gentlefolk. Here, we’re also treated to two completely irrelevant types of man-monsters. 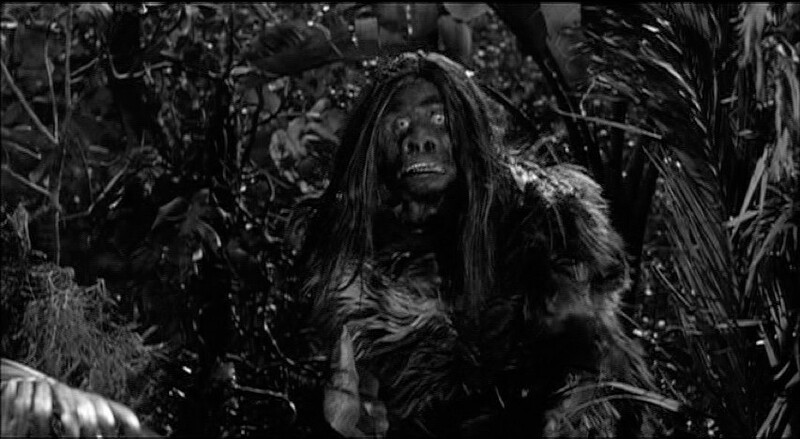 The first ones attack the duo on the first night and appear to be meant to be Neanderthal. I have no idea what the others are, but they live in the darkness and fear light. They show up exactly once and are never seen again, despite further expeditions into their cave. 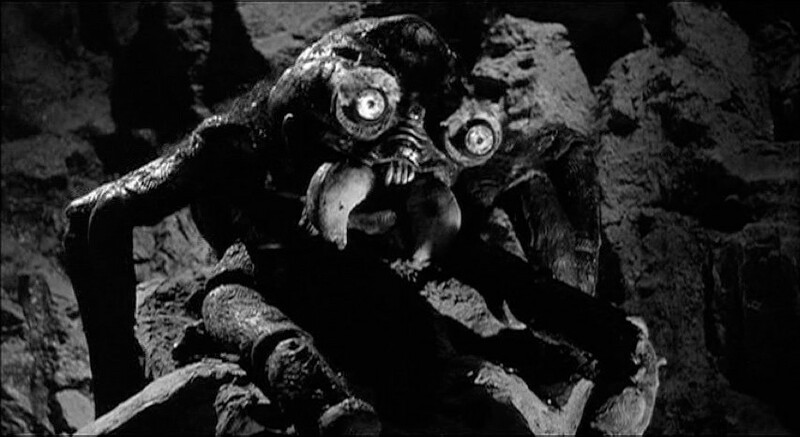 Also appearing once, never to be mentioned again, is the giant spider that our heroes meet in a cave early in the movie. In a moment of exquisite unintentional comedy, the thing falls on top of Servadac, somehow sending Denning stumbling into a web several feet away. It’s a glorious bit of nonsense action choreography. Of course, Denning frees himself and saves Servadac, but the seriousness with which the actors perform the scene is completely undone by the ridiculous goggle-eyed spider and its rubbery legs. Honestly the film could use more scenes like this, because there’s way too much clunky business with the tribes and waggling spears at rear projections. The goofy spider stands out for actually being on set with the actors. A lot of the special effects are lifted from One Million B.C. , to the extent that the tribes’ costumes are modeled on those that appear in the reused footage. 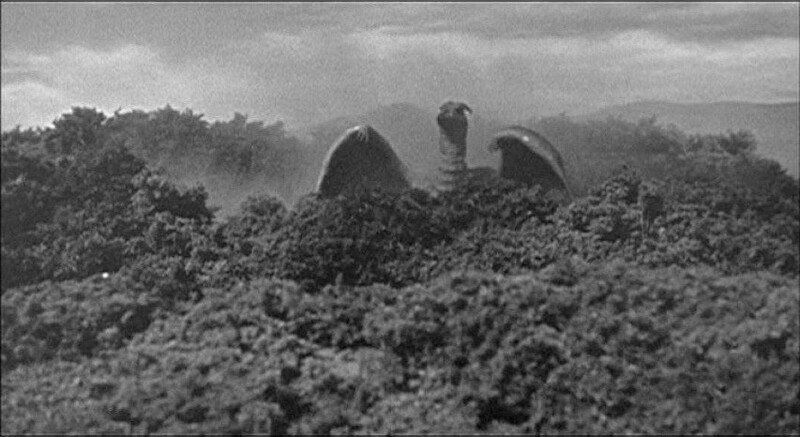 Other sources are used for scraps, including a few shots from Rodan (converted to black and white) passing the monster off as a straight-up pterodactyl. I’m afraid that there’s no getting around the fact that Valley of the Dragons isn’t very good. If it’s dinosaurs you want, you should just watch One Million B.C. . The Jules Verne content is barely recognizable, so it’s not a must-see for casual fans. The narrative is built almost entirely around how to connect the reused footage, making it oddly paced and unsatisfying. About the only recommendation I can give for seeing this is to gape at its simultaneous immersion in Lost World themes and stubborn refusal to carry them through to conclusion. For that alone, it stands as an outlier of the genre and deserves recognition for being unique.